Goldman grew up in a Jewish family in Kaunas, Lithuania (then under control of the Russian Empire), where her family ran a small inn. Her parents were Abraham Goldman and Taube Bienowitch. In the period of political repression after the assassination of Alexander II, the Jewish community suffered a wave of riots and the family moved to Saint Petersburg when Emma was 13. The severe economic hardship of the time meant that she had to leave school after six months in Saint Petersburg and work in a factory as a corset maker. It was in that workplace that Goldman was introduced to revolutionary ideas and the work of revolutionary anarchists, including the history of previous political assassinations in Czarist Russia and the concept of revolutionary violence as a tool for social change. Goldman secured a copy of Nikolai Chernyshevsky's What Is to Be Done, in which the heroine Vera is converted to nihilism and lives in a world of equality between sexes and co-operative work. The book offered an embryonic sketch of Goldman's later anarchism and also strengthened her determination to live her life in her own independent way. At 15 her father tried to marry her off but she refused. When Emma was 17 it was eventually agreed that the rebellious child should go to America with her elder half-sister, Helena. Goldman quickly realized that for a Jewish immigrant, America was not the land of opportunity that had been promised. America, for her, meant slums and sweatshops where she earned her living as a seamstress. She worked for several years in a textile factory, and, in 1887, married fellow factory worker and Russian immigrant Jacob Kershner, thereby gaining U.S. citizenship. What initially drew Goldman to anarchism and turned her into a revolutionary at the age of 20 was the outcry that followed the Haymarket Riot in 1886 in Chicago. A bomb had been thrown into a crowd of police during a workers' rally for the eight-hour day. Eight anarchists were convicted and seven sentenced to death on the flimsiest evidence; the judge at the trial openly declared: "Not because you caused the Haymarket bomb, but because you are Anarchists, you are on trial." Four were ultimately hanged. 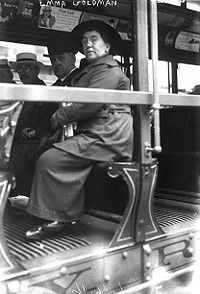 Following the uproar over the hangings, Goldman left her husband and family and traveled to New Haven, Connecticut, and then to New York City. Goldman and Kershner soon divorced. Here, Goldman befriended Johann Most, the editor of a German language anarchist paper. She was inspired by his fiery oratory and calls for violent struggle and became a confirmed believer in the concept of the Attentat, the use of targeted acts of violence—including assassinations of politically significant individuals—as a necessary tool to inspire political and social change. Most quickly decided to make Goldman his protégé and sent her on a speaking tour. He instructed Goldman to condemn the inadequacy of a campaign for the eight-hour day. Instead it was necessary to demand the complete overthrow of capitalism. Campaigns for the eight hour day were merely a diversion. Goldman duly conveyed this message at her public meetings. However, in Buffalo, she was challenged by an old worker who asked what a man of his age was to do, as they were not likely to see the ultimate overthrow of the capitalist system. From this encounter Goldman realized that specific efforts for improvement such as higher wages and shorter hours, far from being a diversion, were part of the revolutionary transformation of society. Goldman began to distance herself from Most and became more interested in a rival German anarchist journal Die Autonomie. Here she was introduced to the writings of Peter Kropotkin. She sought to balance the inclination of human beings toward social ability and mutual aid stressed by Kropotkin with her own strong belief in the freedom of the individual. While Berkman and Goldman had believed they were following Johann Most's precepts for revolutionary change, they were soon disillusioned by their former mentor. One of Berkman's most outspoken critics after the assassination attempt was none other than Most, who had always, noted Goldman, "proclaimed acts of violence from the housetops." Yet in Freiheit, Most attacked both Goldman and Berkman, implying Berkman's act was designed to arouse sympathy for Frick. According to the historian Alice Wexler, Most's motivations, may have been inspired by jealousy of Berkman, or possibly by his changing attitudes towards the effectiveness of political assassination as tool to force revolutionary change. In 1893, Goldman became friends with Hippolyte Havel, and began to travel widely, giving speeches on behalf of the libertarian socialist movement, often funded by the Industrial Workers of the World (IWW). Goldman was imprisoned in 1893 at Blackwell's Island penitentiary for publicly urging unemployed workers that they should "Ask for work. If they do not give you work, ask for bread. If they do not give you work or bread, take bread" (the statement is a summary of the principle of expropriation advocated by anarchists like Peter Kropotkin). She was convicted of "inciting a riot" by a criminal court of New York, despite the testimony of 12 witnesses in her defense. The jury based their verdict on the testimony of one individual, a Detective Jacobs. Voltairine de Cleyre gave the lecture In Defense of Emma Goldman as a response to this imprisonment. While serving her one-year sentence, Goldman developed a keen interest in nursing, which she put to use in the tenements of the Lower East Side. Leon Czolgosz, an insurrectionary anarchist, shot President McKinley on September 6, 1901, as McKinley attempted to shake Czolgosz's hand. On September 10 the authorities arrested Goldman and nine other anarchists, including Abe and Mary Isaak, for suspicion of conspiracy in a plot with Czolgosz. Goldman had met Czolgosz briefly several weeks before, where he had asked Goldman's advice on a course of study in anarchist ideas. The assassination of McKinley and the rapidly-escalating use of violence by other immigrant anarchists stained the cause of Anarchism and discredited it in American popular opinion, making its association a slur. Consequently, causes which anarchists had championed (such as the labor movement) sought afterward to disassociate themselves from self-identifying anarchists. Goldman was released on September 24 after authorities were unable to connect her and the others directly to Czolgosz's crime. Czolgosz was found guilty of murder and executed. In 1906, Goldman published Mother Earth with Berkman, a monthly journal in which she covered current affairs from an anarcha-feminist perspective, and reprinted essays by writers such as Friedrich Nietzsche and the Christian anarchist Leo Tolstoy, who were both major influences on her thinking. On the former she said, "Nietzsche was not a social theorist, but a poet, a rebel, and innovator. His aristocracy was neither of birth nor of purse; it was the spirit. In that respect Nietzsche was an anarchist, and all true anarchists were aristocrats." The custom of procuring abortions has reached such appalling proportions in America as to be beyond belief…. So great is the misery of the working classes that seventeen abortions are committed in every one hundred pregnancies. While in prison, Goldman met and became friends with Gabriella Segata Antolini, an anarchist and follower of Luigi Galleani, whom she would later meet in person. Antolini had been arrested transporting a satchel filled with dynamite on a Chicago-bound train. She absolutely refused to cooperate with the authorities or supply them with any information, and was sent to prison, eventually serving 14 months before being released. During this period, Goldman continued to travel extensively, giving speeches against the war, and meeting other members of the radical left in America. After her release from jail, Berkman returned from San Francisco to work with Goldman and write once more for Mother Earth. 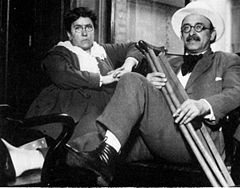 While in Barre, Vermont, she met Luigi Galleani, a self-described subversive, associate of various anarchist communist groups, and editor of the anarchist journal Cronaca Sovversiva as well as an explicit bomb-making manual covertly titled La Salute é in Voi (The Health is Within You), widely disseminated by anarchists. As an insurrectionary anarchist, Galleani was a confirmed believer in the violent overthrow of the government, a fact of which Goldman was well aware. This meeting and brief association would later come back to haunt her. Goldman's third imprisonment was in 1917, this time for conspiring to obstruct the draft. 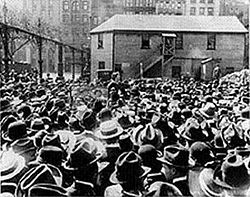 Berkman and Goldman were both involved in forming No conscription Leagues and organizing rallies against World War I. She believed that militarism needed to be defeated to achieve freedom, writing in Anarchism and Other Essays, "The greatest bulwark of capitalism is militarism. The very moment the latter is undermined, capitalism will totter." Under U.S. laws of the time, since Goldman's U.S. citizenship had been revoked, she could be deported as an undesirable resident alien under the Sedition and Anarchist Acts, as well as a resident alien convicted two times or more for crimes. At the hearing, her association with known advocates of violence was used against her, including her meeting with Luigi Galleani. The government's representative at the hearing was J. Edgar Hoover, who called her "one of the most dangerous anarchists in America." She was ordered deported together with Berkman, and the two went on a whirlwind tour of anarchist dinners and receptions around the country in the days prior to her deportation. Goldman was deported at the end of 1919, and placed with other resident aliens of Russian origin on a ship bound for the Soviet Union. 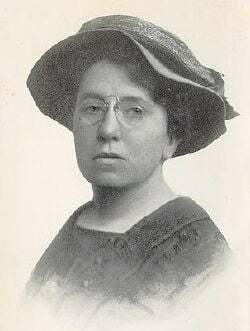 Her deportation, along with thousands of other radicals rounded up in the Palmer raids, meant that Goldman, with Berkman, was able to witness the aftermath of the 1917 Bolshevik Revolution first-hand. On her arrival in Russia, she was prepared to support the Bolsheviks despite the split between anarchists and statist communists at the First International. But seeing the political repression and forced labor in Russia offended her anarchist sensibilities. In 1921, repression by the Red Army (under the direct leadership of Leon Trotsky) against the striking Kronstadt sailors left Goldman and other anarchists keenly disillusioned with the Bolsheviks. The Bolsheviks, however, argued that the Kronstadt sailors had conspired with the White Army and French monarchists, thus representing a significant counter-revolutionary force. This led Goldman to write My Disillusionment in Russia and My Further Disillusionment in Russia. She was also devastated by the massive destruction and death resulting from the Russian Civil War, in which counter-revolutionary elements, aided by foreign governments such as the United States and Japan, attempted to throttle the young communist state before it could spread its subversive ideology to other lands. Goldman was friends with American communists John Reed and Louise Bryant, both of whom were also in Russia at this time when it was impossible to leave the country; they may even have shared an apartment. I know that in the past every great political and social change, necessitated violence…. Yet it is one thing to employ violence in combat as a means of defense. It is quite another thing to make a principle of terrorism, to institutionalize it to assign it the most vital place in the social struggle. Such terrorism begets counter-revolution and in turn itself becomes counter-revolutionary. These views were unpopular among radicals as most still wanted to believe that the Russian Revolution was a success. When Goldman moved to Britain in 1921, where she stayed with old friends, she was virtually alone on the left in condemning the Bolsheviks and her lectures were poorly attended. On hearing that she might be deported in 1925, a Welsh miner, James Colton, offered to marry her in order to give her British nationality. Thus, she was able to travel to France and Canada. She was even permitted to reenter the United States for a lecture tour in 1934 on condition that she refrain from public discussion of politics. Goldman also spent some time in France, where Peggy Guggenheim raised funds for a cottage in Saint-Tropez on the Cote d'Azur. They called her house Bon esprit ("good spirit"). There she could write and receive correspondence, but was isolated. In 1936 Berkman shot himself due to his poor health, months before the outbreak of the Spanish Civil War. Goldman rushed to his deathbed in Nice. Politically the human race would still be in the most absolute slavery were it not for the John Balls, the Wat Tylers, the William Tells, the innumerable individual giants who fought inch by inch against the power of kings and tyrants. At a rally of libertarian youth she said: "Your revolution will destroy forever the notion that anarchism stands for chaos." She disagreed with the participation of the CNT-FAI in the coalition government of 1937 and the concessions they made to the increasingly powerful communists for the sake of the war effort. However she refused to condemn the anarchists for joining the government and accepting militarization as she felt the alternative at the time would be a communist dictatorship. Goldman died of a stroke in Toronto on May 14, 1940, at the age of 70. The U.S. Immigration and Naturalization Service allowed her body to be brought back to the United States, and she was buried in German Waldheim Cemetery in Forest Park, Illinois, a suburb of Chicago, close to where the executed Haymarket Riot defendants are interred. Her tombstone reads: "Liberty will not descend to a people, a people must raise themselves to Liberty." Goldman, Emma. My Disillusionment In Russia. reprint ed. Williamson Press, 2007. This page was last modified on 7 September 2008, at 16:26.